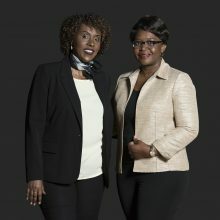 The right person for Christine was Léocadie Kabogoye, a settlement worker with the Conseil Économique et Social d’Ottawa Carleton (CESOC), an organization that assists Francophone newcomers. When Léocadie and her family came to Ottawa and Burundian refugees in 2010, they too had turned to CESOC for support. Now the tables have turned and for the last five years, Léocadie has helped newcomers like Christine in their long journey towards integration. “Léocadie is very professional, punctual, and cheerful and is an extremely good adviser,” adds Christine. “She typifies Canada’s reputation as a country that is favorable to immigration. She takes the time needed with each of her clients, shows a great deal of empathy, while at the same time remaining professional. Léocadie is the kind of person who is very hard to forget. She is a true welcoming ambassador for Ottawa!” Christine knows she can call Léocadie at any time, with any question. She has also become like a sister to her. Every day Léocadie seems a minimum of four clients like Christine, many of whom are in a state of shock. Sometimes her clients just need sometime who will listen to them and guide them through the maze of services, programs and paper work. She shares her large network with them.